A mysterious alchemy called “la part des anges” (the angels’ share) refers to the evaporation of part of the brandy and the reduction in the alcohol content through the oak barrel. Over time, the Armagnac becomes darker and darker, the aromas of vanilla, prune and dried fruits become more pronounced and the alcohol content falls due to evaporation. 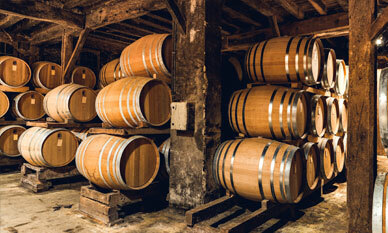 Once it has been distilled, the Armagnac is left to age in “pieces”: 420-litre oak barrels. The woody substances become more refined, the aromas of vanilla and prune become more pronounced, the “rancio” character appears and the alcohol content gradually falls through the evaporation of the alcohol (“part des anges”). The brandy takes on an attractive amber colour before turning mahogany. The brandies are aged in wine cellars with dirt floors, built to avoid excessive variations in temperature in summer and winter alike and to maintain a suitable moisture level.